Carrin Mahmood of Mahtomedi, Minnesota joins us to talk about her book club. After getting off to a slow start, she and the ladies of "Chapter Chat" have now been sharing their reading experiences for eight years. In this interview she reveals the 'it' factor that made the club a success. BookBrowse interviews Carrin Mahmood of Mahtomedi, Minnesota joins us to talk about her book club. After getting off to a slow start, she and the ladies of "Chapter Chat" have now been sharing their reading experiences for eight years. In this interview she reveals the 'it' factor that made the club a success. about all aspects of their book club. Hello Carrin, thanks for taking the time to chat. First off, please tell us a bit about Chapter Chat. We've been together in our current format for 8 years, but some of us have been reading together for 15 years. We have 16 on our e-mail list but typically 8-12 show up for any given month. We are in our 40's and 50's, all women. Our core started as a Mom's Group at our church, but we have since taken jobs, sent kids off to college, had surprise babies, grandchildren, divorces and marriages. Like most groups of women we have been there for each other through cancer, deaths in the family, and general support and laughter. Meet on a consistent night. Passionate readers will schedule around the book club. Meet in homes because when a meeting is hosted by a church or library it's so easy to think…'Oh there will be other people there, I don't have to go" etc. Adding dessert and wine didn't hurt either! Is your church affiliation important to the group? Yes and No. We did all meet through church and being Christian is a core part of who we all are. But we don't read literature which is billed as, "Christian Literature." There are so many lessons to be learned, and God is so vast that we can find the sacred in most good literature, and the rest we chalk up to "what not to do!" We are diverse, passionate and creative. We definitely meet to discuss the book and everyone brings something to the table. 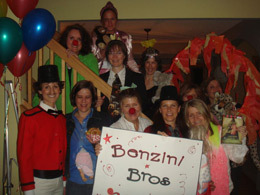 Someone almost always shows up in a costume of some sort, and we have been blessed with creative hostesses. When we discussed Shadow Divers by Robert Kurson our hostess Nancy arranged for a Navy officer (in his knee melting "whites" no less!) to come and tell us what months on a submarine would be like. The same hostess also turned her home into a circus tent when we read Water for Elephants by Sara Gruen. A literal hard act to follow! We read The Persian Pickle Club by Sandra Dallas and I am fortunate enough to have friends who quilt so they came over and set up a large quilting frame for us, and generously let us novices work on their quilts, so we could have a quilting bee while discussing that wonderful book. Wow, you certainly sound like a dynamic bunch! How did you choose your name? We had a list of 20 names that Nancy and I came up with (I guess we are the "founders" of Chapter Chat). We wanted it to reflect the fact that we really do meet to discuss the book, and not just to socialize, as our husbands have accused. Other than in homes, where else have you met? We read November of the Heart by LaVyrle Spencer, which is set in a yacht club, so we held our meeting at a local yacht club because one of our members has a membership; and, of course, we had to go to a restaurant on the Mississippi when we read The Last Girls by Lee Smith; we also visited the zoo to discuss The Zookeeper's Wife. Are there any particularly memorable moments that you'd like to share? William Kent Krueger is a local author. We have read several of his books which all take place in the Boundary Water Canoe Area. He writes at a local "greasy spoon" and we reserved one of their rooms. (They have clearly expanded from their greasy spoon days!) Mr. Krueger was accepting an award that night and was going to try and stop by. We spotted him entering the restaurant, and the facilitator for the night, and his biggest fan, ran over with her camera, her copy of Mercy Falls and her sharpie for an autograph. By the frightened look on the man's face, we soon realized that it wasn't him. The entire restaurant was laughing at her apologizing and him apologizing for not being William Kent Krueger! We meet on the first Thursday of the month at 7 p.m. except for July, when we move it to the second Thursday because of the 4th. We have a sign up sheet and everyone volunteers to take a month. That means their home, or a place they arrange. How do the dynamics of your meetings work? We have fallen into a routine of arriving at 7 p.m., and then talking and "snacking" until 7:30. Then the facilitator for the month (We rotate on a volunteer basis, some are not comfortable, most are) moves us into the discussion area. We usually discuss until 9 p.m. or so, and when it winds down the hostess brings out dessert and coffee. We have gotten much better at not getting off topic, mostly because everyone has facilitated and they know that a lot of work goes into it. You can come without having read or finished the book, but no exceptions in conversation will be granted. In other words, you have to know that we will be talking about the ending so if you want to be surprised you have to finish, or bow out that month. We are pretty careful about public places because it gets really hard to hear. We have a local coffee shop that closes at 7, but agrees to let us stay privately until 9. Otherwise we look for private rooms or corners. How do you organize yourselves outside of meetings? One of our members, Deb has graciously fallen into the organization role. She keeps track of who is facilitating, hosting, and what books we are reading when. She also sends out a reminder every month to RSVP to the host, which is great. We use e-mail mostly for organizational things, and a few of us keep a blog going. It's at http://chapterchatmn.blogspot.com/ It could be more fascinating but it's been a tough training process. Most members view the comments, but only 2-3 of us actually post. On the contrary, I took a look and found it very good with an impressive number of posts! You are too modest. It took me a bit of time to work out the relevance of the post about the death of Robert Mondavi, but I kept reading and found it! So after discussing 70+ books, what would you say are the defining features of books that generate good discussions. If the book has been well researched and the meeting is well facilitated. It makes all the difference in the world! Any books that generated particularly good discussions or were favorites? Nickel and Dimed: On (Not) Getting By in America by Barbara Ehrenreich; Shadow Divers by Robert Kurson and Pope Joan by Donna Woolfolk Cross all generated good discussions, especially so for Pope Joan as we chatted with Donna Woolfolk Cross by phone. We are so varied in our likes, but Peace Like a River by Leif Enger was a favorite, also a funny little novel called Isn't it Romantic by Ron Hansen - it was an out of character read for everyone, but we all loved it. Are there any books that bombed? If so, why do you think they did? Are there any particular issues that you've had to work through over the years? Ha! Get 3 or more people together and there are issues. One member attended for years without reading. She just watched the movie version if there was one, but made great contributions. On the other hand I am a former English teacher and run the risk of giving my friends detention when they're not paying attention. We are serious enough for those of us looking for some good meat, and fun enough for those who aren't. Our blog helps a few of us discuss and research further. We have also suggested Lit classes at a local college and some other ideas for the few who were seeking deeper or lengthier discussions. Side conversations still pop up now and then, especially if all the members attend or we can't hear well. We have developed a way of choosing books that works for us. It changes over the years but we try to vary the genres, get as many reads as possible in paperback, and keep the 500 + pagers to a minimum. Everyone takes a month and gets their choice. If you were starting from scratch is there anything you'd do differently? Begin in homes right away. Rotate who chooses, it gives you nice variety. Rotate facilitating, it gives you an appreciation of the work put in! Be really clear about your level of commitment to reading and discussing, are you a social group that mentions the book; or a book group that also enjoys the company; or like one friend who has a reading group…that reads wine labels!